As his junior or "II, Second," my father, FELINO BORBON AMISTAD, was a proud Ilocano farmer son from Mabini, Pangasinan. He was born in June 1, 1919. I am proud to carry on the tradition of the Amistad legacy in America. As the middle son of hard working professional immigrants who came to America by way of the U.S. Territory of Guam, there is no question that America brought my parents and their children and other siblings much fortune and opportunities beyond their wildest dreams. My father passed away at 86, in 2005. My mother, "POLLY Fulgencia Alba Repiedad-Amistad, was the youngest of 14 children from a small Visayan town, Banga, in Aklan, the Philippines. She was born Sept. 28, 1925. She passed away on Feb. 15, 2001. Both FELINO and POLLY were distance correspondent daters, and eventually married in Manila before setlling in the U.S. in the 1950s. None of POLLY's siblings are still alive. POLLY's father was the Mayor of Banga, Aklan (my LOLO) and my LOLA, Alba Repiedad, the daughter of Spanish-English-Visayan mixture, ran a variety store. My father had two siblings, younger Felipe Amistad (now deceased) and a sister, Pinay Amistad-Capital. still living in the Philippines. The "lolos" or grandparents from father's side were hardworking farmers from many generations of rural Pangasinan villagers. They worked on the land to cultivate produce to feed their families and sell goods to local stores and merchants. However, father Felino Sr. did not sit idle as a farm hand. He fled as a young teenager to Manila in order to purse an accounting BBA degree from Far Eastern University. To pay for college, he worked for a medical doctor-politician as an errand and domestic helper. This humble beginning endured until he completed college and then emigrated to America. It helped him learn to survive and work to earn and invest. My mother POLLY also went to college at Far Eastern University, earning a teaching credential with concentration in English and literature. She taught in Guam schools. My father invested in a publishing and printing business on Guam in th 1960s while my mother started Cosmetology and Dressmaking schools. They parlayed their life's savings into real estate and most of their savings in the Bank of Guam. My father co-founded in 1972 the first locally owned (Guamanian) FDIC insured-chartered bank on the island and became the first Filipino director of a U.S. Banking institution. Bank of Guam has over 2 dozen branches and even one in San Francisco, California. It is biggest bank in the Marianas and Micronesia area. My father FELINO was the only Filipino director. He eventually held offices of secretary-treasurer. I am proud o my father's accomplishments, especially being the first Filipino to start a US Bank. Today this bank is a multi-billion dollar institution in terms of deposits and equity. My parents diligence and frugality allowed me and my 4 other siblings the chance to pursue mainland US education in California and elsewhere. My oldest brother, Glenn, went onto Chaminade University of Honolulu to pursue a BBA in accounting and later an MBA from Golden Gate University. My sister Cris and Pollyanna pursued local college degrees, with Pollyanna recently finishing her MBA. She holds a BS in finance from Unviersity of Maryland. Judith the youngest did college at Belmont's College of Notre Dame. My other cousins on my father's side are now residing in America, having been brought first to Guam by my father's generous help. My father's brother came to Guam to start a better life. His family ensued and the first cousins have professional work in nursing and teaching throughout the US. My cousins through my mother's side live in California and are second and third generation Californians. In all we have over 100 close cousins and relatives in the US who are intermarried with mainland Americans. First and second cousins reside in Oklahoma, New York, Texas, Nevada, and Washington. One cousin, Dr. Etcubanas taught at Stanford Medical School before working for an Oakland Medical practice. She was married to a second generation Chinese-American physician. One daughter went onto to an East Coast Ivy League college and settled in New York. My current daughter, Christine, is a dental school student finishing her work at the University of the Pacific in San Francisco, California. She graduated from Hillsdale High School in San Mateo 2002 and served as a Youth Commissioner of San Mateo County during her last senior year of high school. Her mother, Mariane Gonzales Leyson, was born in Manila before moving to California in 1990. Her father was a US Navy ensign and her mother was a businesswoman who divorced him and settled in San Mateo, California. Mariane married three times and now settles in Manila. As far as my high school years. I graduated valedictorian from Fr. Duenas School in Guam before heading to college at Stanford University where I was a pre-med graduate. In Guam, I won debate competitions with a top award which made me "Guam Governor" for Student Government Day. This experience opened my interest into politics and public service. I pursued an MBA and a Law Degree (JD) later on in life. 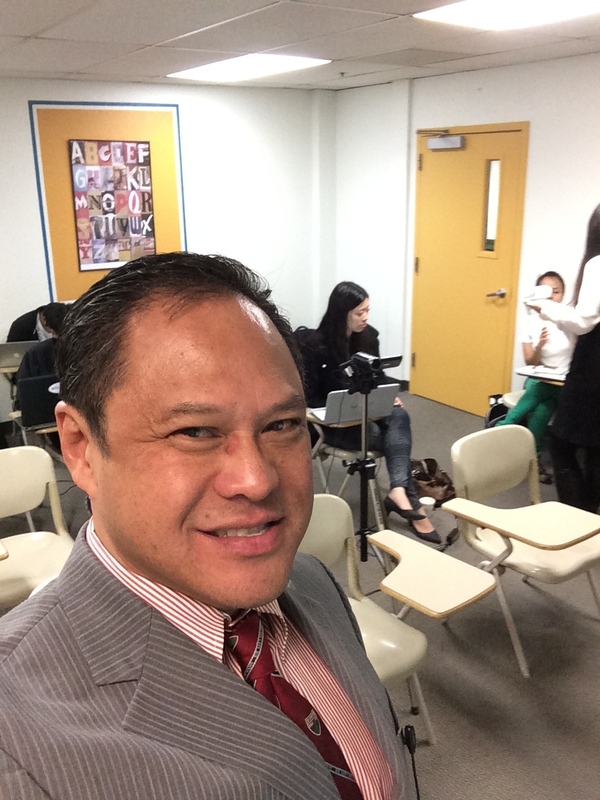 I completed a PhD in Business Administration and now I currently teach MBA students in Silicon Valley at International Technological University in San Jose and I am Dean/VP/COO at California Pacific University, Pinole, California. I served as Stanford Alumni volunteer along with past presidencies of the Lions Club (2005-6, West of Twin Peaks), Filipino American Chamber of Commerce (2007-8), FilAm JayCees SF (1991-2), Filipino American Democratic Club of San Mateo County (2010), Co-Chairman, FilAm State Democratic Caucus, California Democratic Party, and National Vice President 80/20 Initiative.net 2004-5. Before academic work, I was the CEO of Citibankers Mortgage Company in San Francisco and currently, I am an Associate Real Estate Broker with Century 21 in San Mateo-Hercules-SF. I also run a mortgage company, refinance and engaged in purchase money financing/lending in the state of California since 1987. I originated residential and commercial loans and sold over $200 million in real estate transactions. This supplemental work along with teaching college have allowed me time to pursue public service. In the public service area, I was recently appointed by Governor Jerry Brown to the Board of Professional Engineers, Land Surveyors, and Geologists where I oversee 100,000 engineers and geologists, regulating and making policy that impacts the lives of 40 million Californians. I served in Brown's administration in 2015. Before this state appointment, I was a County Commissioner of San Mateo County, helping the health care services department, advising and caring for the disabled and challenged members of our communities (6 years from 2007). Prior to these appointments, I ran a few County political races for College and High SchoolTrustee. I am a contender for San Mateo County Central Commiitteeman for June 2016 primary election. 1. Dr Amistad with only daughter Christine Nicole Amistad, dental student. 6. Dr. Amistad and California Governor Jerry Brown at his inauguration, Sacramento. 7. Dr. Amistad and Christine Amistad congratulate lt. Governor Gavin Newom, inaugural day.